Will luxury hotel groups soon no longer be content with their prestigious establishments? The answer is no for the Four Seasons Hotels & Resorts, who have come up with a new way to travel around the world. In a private jet. The black Four Seasons Private Jet isn't exactly inconspicuous, neither on the ground nor in the air. 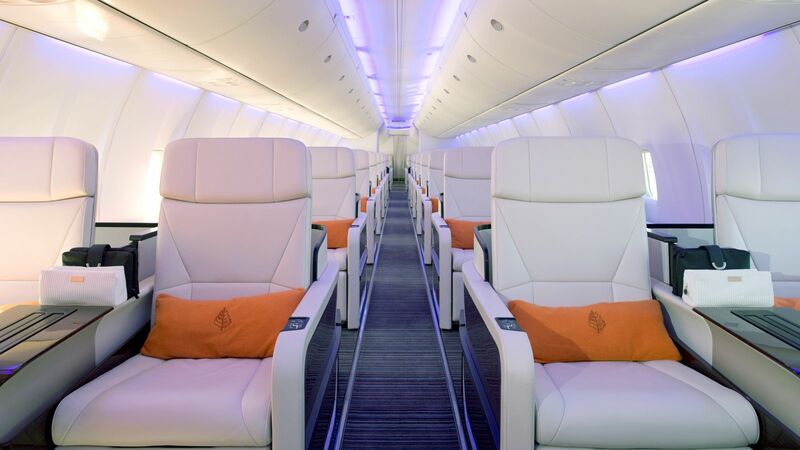 This Boeing 757, equipped with a Rolls Royce motor, has also been luxuriously customized by a host of designers. The reclining white leather seats were handcrafted by Italian VIP aircraft seating manufacturer Iacobucci. The blankets, in case any of the 52 passengers gets chilly, are made from soft Mongolian cashmere and were commissioned exclusively for the plane. Beneath your feet, a bespoke hand-woven woolen carpet made in Amsterdam. The crew is made up of ten people, including an Executive Chef, a Sous Chef, a Four Seasons Concierge and a Global Guest Services Manager. 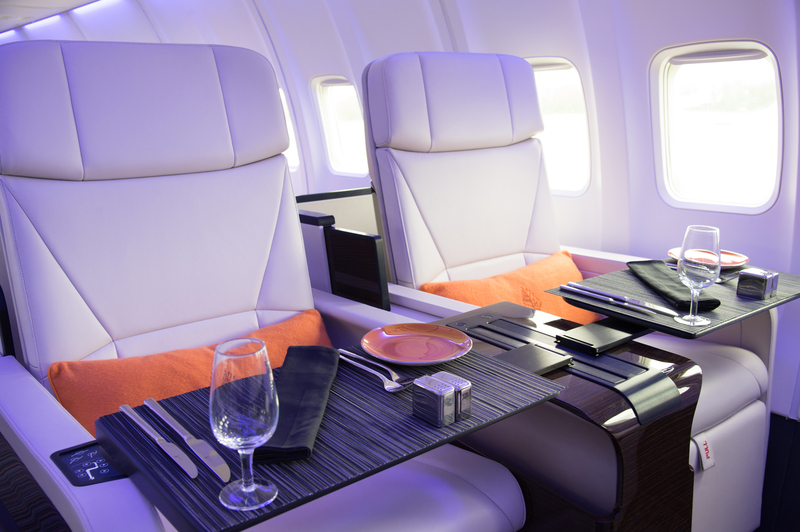 "Our aim is to recreate the hotel experience on the Four Seasons Private Jet, which means creating innovative meals using fresh ingredients, served on the finest tableware and linens, all with impeccable Four Seasons service. The only real difference is that occasionally we have to do a little juggling when there's turbulence!" says the airline's chef Kerry Sear. 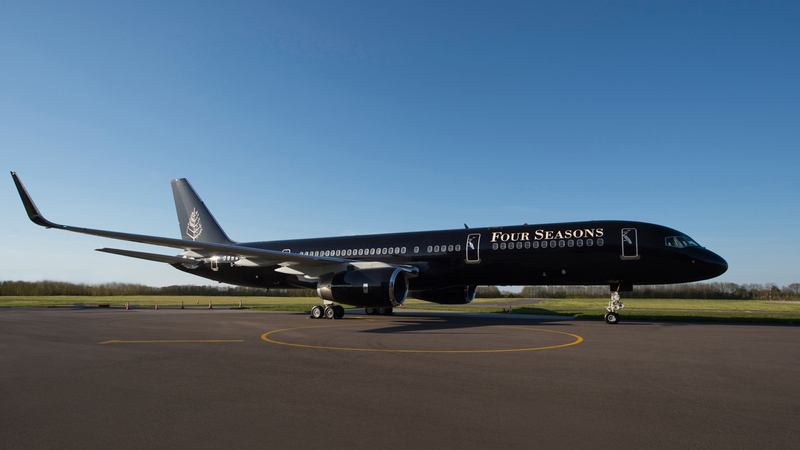 "The launch of the hotel industry's first fully branded Private Jet earlier this year was in response to the growing demand among modern luxury travelers for a fully immersive Four Seasons experience both in the air and on the ground," says Christopher W. Norton, Executive Vice President, Global Product and Operations at Four Seasons. Prices start at $69,000 to tour Europe and $119,000 for a trip around of the world. The hotel group is quick to point out that 80% of tickets for trips in 2015 have been sold. The price includes air travel, ground transfers, excursions, and full room and board in Four Seasons hotels. The itineraries for 2016 have already been decided, and the year will begin with what Four Seasons has branded "Timeless Discoveries: An Around the World Journey." From January 16 to February 18, the private jet will successively set down in Los Angeles, Kona, Bora Bora, Sydney, Bali, Chiang Mai, Mumbai, Prague and finally London. The following itinerary, referred to as "International Intrigue," will visit eight destinations on four continents from April 14 to May 7.